It's been a while since I spent any time on the Bank St. Irregular blog. I've been reading through some of the old posts, and there's some pretty fascinating stuff here! I'm in the process of launching a new website. 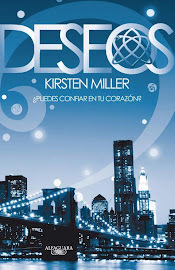 It should be up at kirstenmillerbooks.com in the next few days! There will be a blog attached to the new site, but I couldn't bear to delete Bank St. Irregular. Seven years of hard work went into this blog, and I don't want to say goodbye. So I'm going through the old entries and reposting the best! It may take me some time to fix all the links and remove any bits that are clearly out of date. But that doesn't mean you have to wait to start reading! 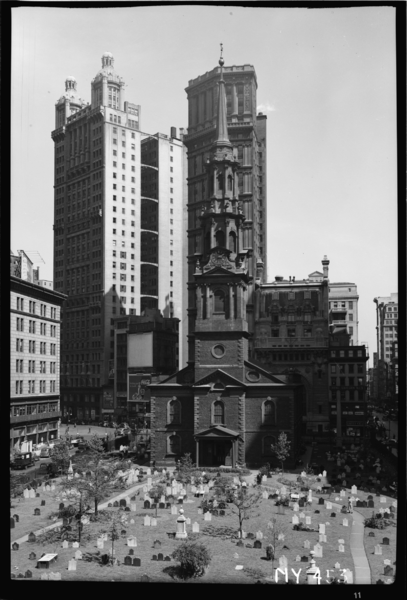 On the corner of Tenth Street and Second Avenue in Manhattan, you’ll find St. Mark’s in the Bowery, the second oldest church in Manhattan. Beneath the St. Mark’s churchyards are stone burial vaults. 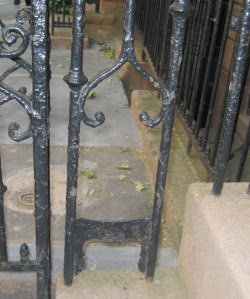 One of these belongs to Peter Stuyvesant, whose spirit is rumored to haunt the vicinity. (If you see a ghost with a wooden leg, that’s probably Pete.) Inside another vault lie the remains of a wealthy businessman named Alexander Stewart, who was buried at St. Mark’s in 1876. Three weeks later, his corpse was stolen and held for ransom. 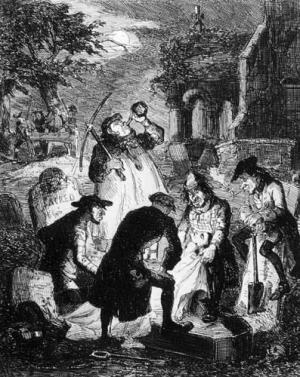 Grave robbing (also known as body snatching) was quite common in the nineteenth century. 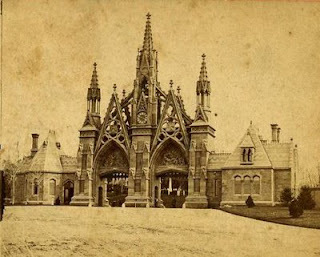 Back then, if you paid a midnight visit to a New York cemetery, you were likely to spot groups of shovel-wielding thieves tiptoeing around in the dark. 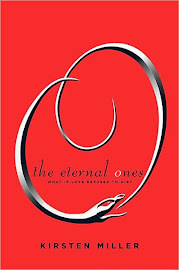 These might have been common crooks raiding coffins and pulling the rings off of skeletal fingers. Or they could have been medical students searching for fresh corpses to dissect. But the grave robbers who stole Alexander Stewart’s body from St. Mark’s in the Bowery were after a much bigger prize—$20,000, to be precise. And they got their ransom from his grieving widow. No one knows for sure if the body that was returned to St. Mark’s actually belonged to Mr. Stewart, but rumor has it that his family took special measures to ensure his remains would not be disturbed. It is said that if the vault is ever opened, the church bells will ring, alerting the city that grave robbers are on the prowl once again. As soon as you pass through the gothic gates of Green-Wood Cemetery in Brooklyn, you will find yourself in the land of the dead. 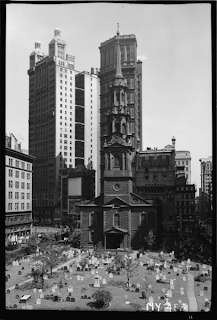 For almost two hundred years, this is where many of New York’s most famous (and infamous) citizens have been buried. Take one of the paths that snake through the 478 acres of woods and valleys and you’ll see bizarre marble tombs perched atop knolls, forbidding mausoleums built into the hills, and countless ghoulish monuments to the dead. You might even spot the entrances to Green-Wood’s underground catacombs if you know where to look. The cemetery is lovely, peaceful, and delightfully creepy. But few people seem eager to spend time with the dead. In fact, if you visit during the week, you probably won’t see another living soul. What you will see, however, are large flocks of parrots. Smart, squawking emerald-green monk parakeets. Decades ago, a few of the Argentinean natives managed to escape from a container at JFK airport. Hundreds of their descendants now call Brooklyn home—and many of them live in Green-Wood Cemetery. 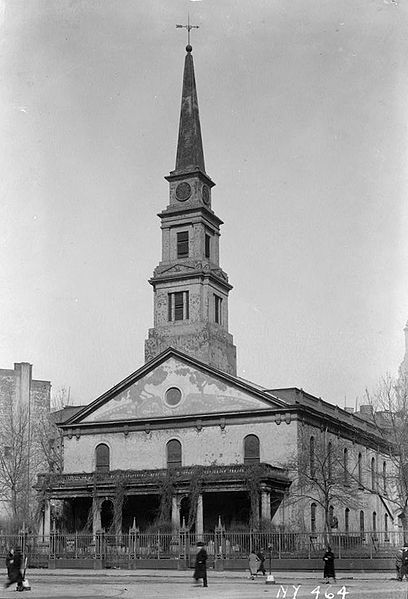 The oldest church in Manhattan is St. Paul’s Chapel. There are many reasons one might choose to visit this historic place of worship. However, I recommend a tour of its graveyard. Lots of well-known dead people are buried there—but only one of them is missing his head. The actor may have been in the grave, but that didn’t prevent his head from returning to the stage. 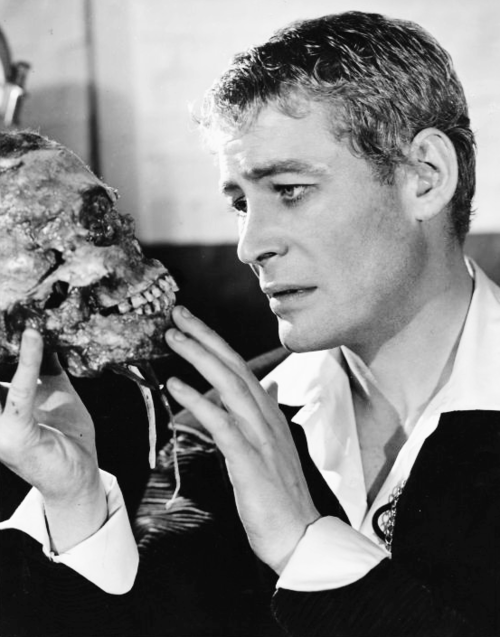 Over the next century or so, Cooke’s skull often appeared in productions of Hamlet. Alas, Poor Yorick! Today, the skull is in the Scott Library at Thomas Jefferson University. Perhaps someone should tell poor Mr. Cooke. They say his headless ghost can still be seen wandering the St. Paul’s cemetery, searching in vain for its missing noggin. Many New York visitors who want a cheap, scenic boat ride will hop on the Staten Island Ferry at the tip of Manhattan, take a round trip, and return to Manhattan without setting foot on Staten Island. They have no idea how much they’re missing. 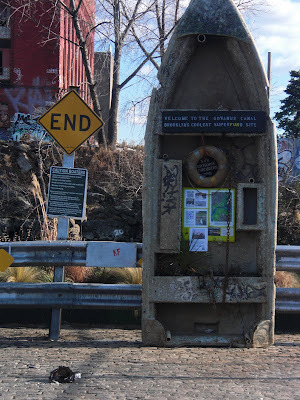 If you head to Rossville on the southwestern coast of Staten Island (take the X19 bus to Arthur Kill Road), you’ll find an extraordinary graveyard. 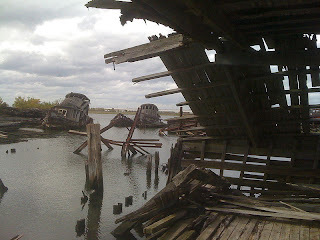 For over one hundred years, the Witte Marine Equipment Company has been hard at work dismantling old boats and ships that once sailed through New York Harbor. It’s a slow process, however, and dozens of boats (mostly tugboats) have been waiting in the shallow waters for decades. Today, many are little more than ghosts of their former selves, which makes the site incredibly eerie. It’s as if the boats were lured to the shore by some malevolent force, then damaged and left for dead. If you’re really adventurous, you might consider renting a kayak and touring the site from the water. But be sure to take your camera along. Once you leave, you may find it hard to believe what you’ve seen. More information (and pictures!) here. For most of the 1800s, boot scrapers were an absolute necessity. Why? Because the streets were disgusting. If you’d taken a walk through most parts of town, your shoes would have ended up caked with rancid muck. Until the 1880s, New York City didn’t have a sanitation department to collect garbage or shovel snow. So it stayed in the streets. 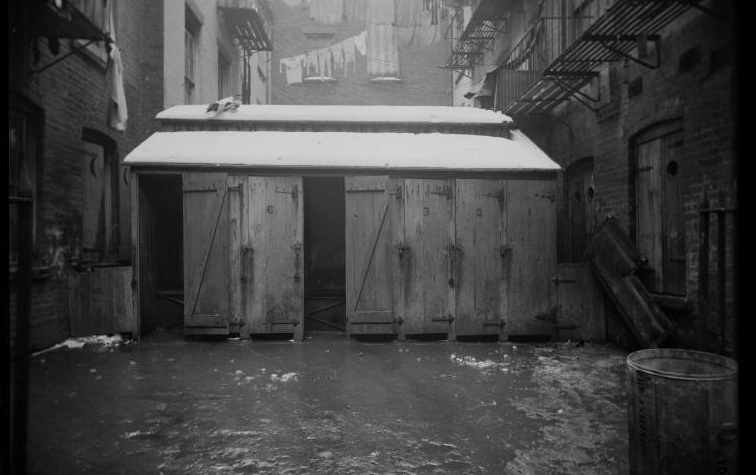 Most neighborhoods still relied on privies that often overflowed—into the streets. And then there were the horses that pulled all those charming old carts and carriages. 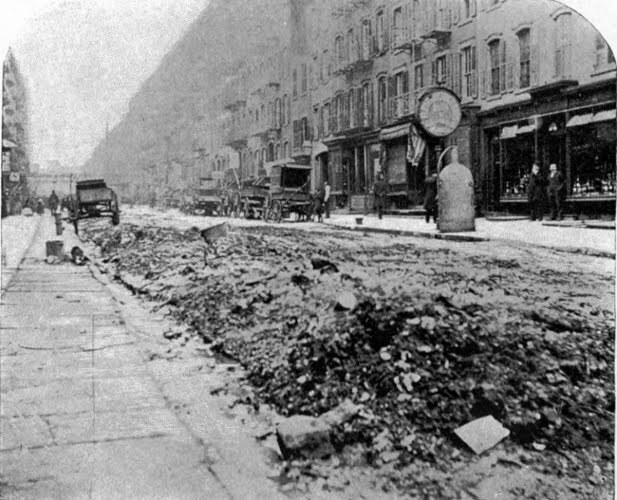 In 1881, horses left 2.5 million pounds of manure on the streets of New York every single day. So think about all those beautiful, ground-sweeping dresses the women used to wear. 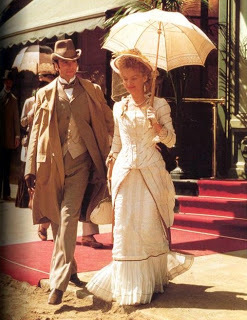 And do remember that a proper lady would have never lifted her skirts to get past a nasty stretch of sidewalk. (She couldn’t risk a gentleman seeing her ankles.) 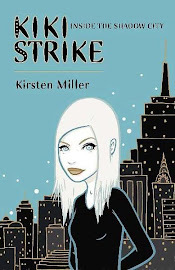 Now aren’t you glad you waited until the twenty-first century to pay New York City a visit? In a city like Amsterdam, which is famous for its canals, living on a houseboat is as good as it gets. However, as you may have already guessed, the canal in Brooklyn is nothing like Amsterdam’s. And yet it too has its share of houseboats. Here’s an exercise that will help you imagine what life might be like for the brave souls who choose to make a home on Brooklyn’s Gowanus Canal. . . . First, get a little toy boat. Then locate the foulest, most disgusting public toilet around. (Gas stations are always a good place to start.) Drop your boat into one of the toilet bowls. Try to pretend that you call that boat home. Imagine the smells and sights one would endure. Pretty horrible, right? Well, believe it or not, there are worse places to live. Like the Gowanus Canal. This is no exaggeration. 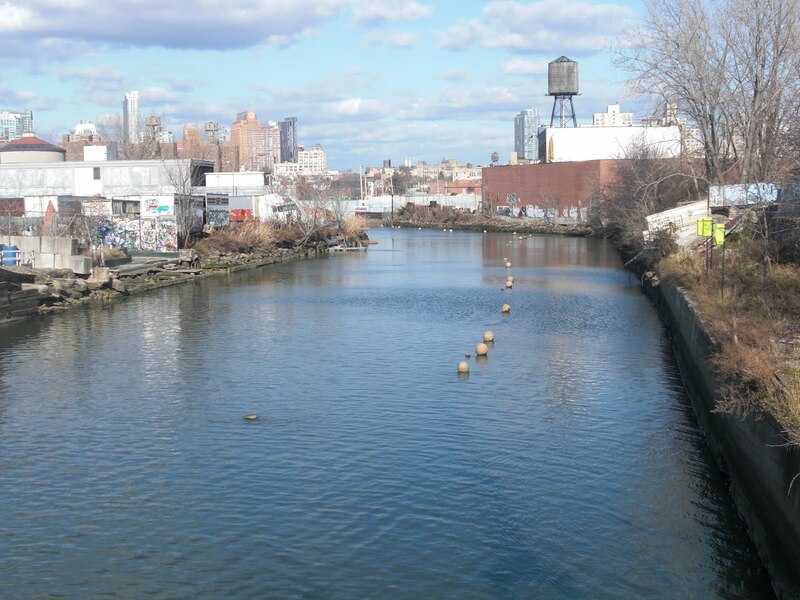 Gowanus water is teeming with countless disease-causing pathogens. Cholera. Typhus. Gonorrhea. 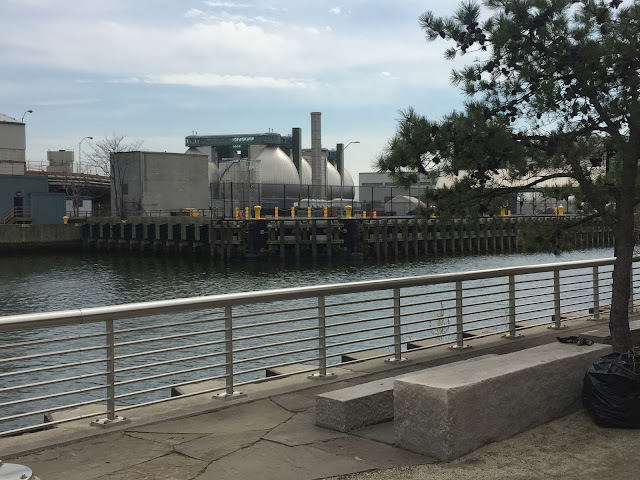 And every time there’s a big rainstorm, New York City’s ancient sewer system releases raw sewage directly into the canal, where it mixes with highly toxic chemicals left behind by the factories, tanneries, and gas refineries that have lined the Gowanus for the past 150 years. Take a dip in the water, and you’d probably emerge with a little less skin. The Gowanus is also rumored to have been a mob dumping ground. Some might argue that such stories are pure fiction, but I honestly couldn’t think of a better place to toss a body or a bag of guns. One of my favorite spots along the canal is the boat dock. 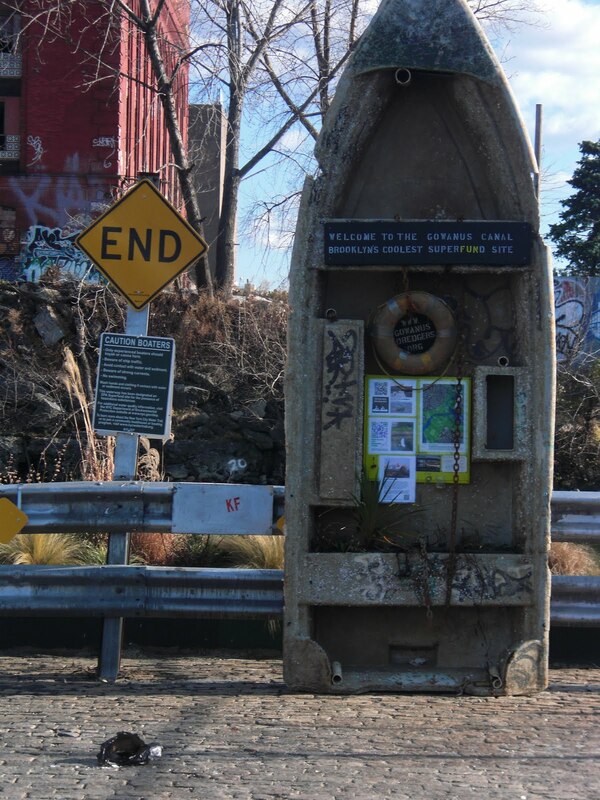 (Look for the boat-shaped “sign” that reads, “Brooklyn’s Coolest Superfund Site.”) There you’ll find a warning that urges boaters to avoid coming into contact with the water or sediment in the canal. Apparently the warnings haven’t dissuaded the canoe club that meets at this site every Saturday from May to October. If you’re interested, members of the public are more than welcome. 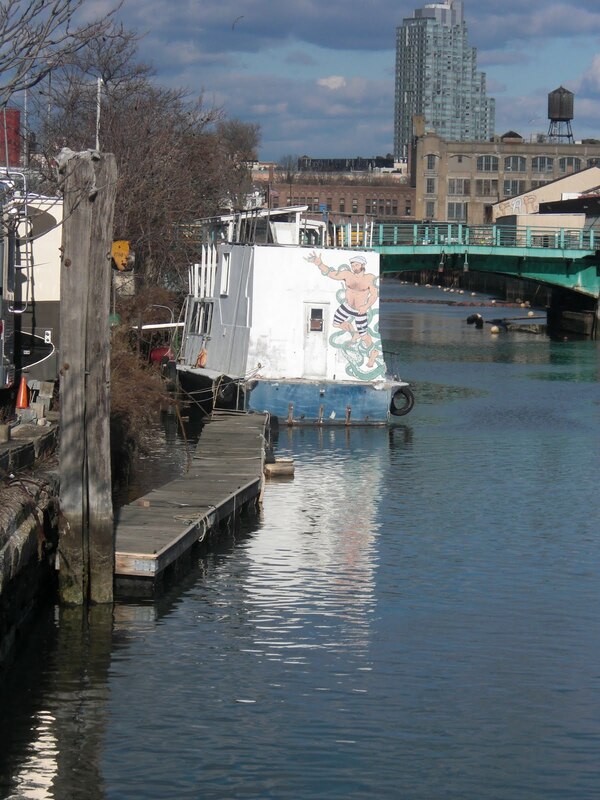 If you’re exploring the Gowanus Canal, you should pay a visit to Public Bath #7 on the corner of Fourth Avenue and President Street. Today, few such buildings remain, but in the late nineteenth and early twentieth centuries, public baths like this one could be found all over the city. In those days, few people were lucky enough to have bathtubs in their homes. And only the wealthy had showers. 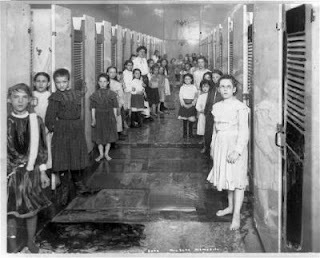 If you were poor, a public bath may have been your only way to get clean. What better way to get to know the neighbors than to shower with them, right? Public Bath #7 is now known as the Brooklyn Lyceum, a multi-use space with a gym, theater, and café. These days, its swimming pool is empty, and its showers were removed long ago. But look closely, and you’ll spot ample proof of the building’s past. Grab a snack at the café, take a peek under the benches, and you’ll see exactly what I mean. 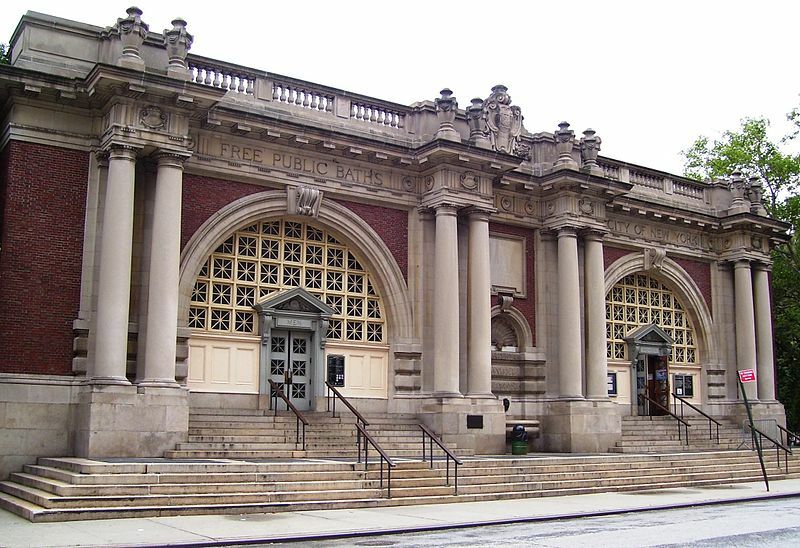 If you’re staying in Manhattan, don’t miss one of the most beautiful public baths ever built in the city. (In fact you can even take a dip! 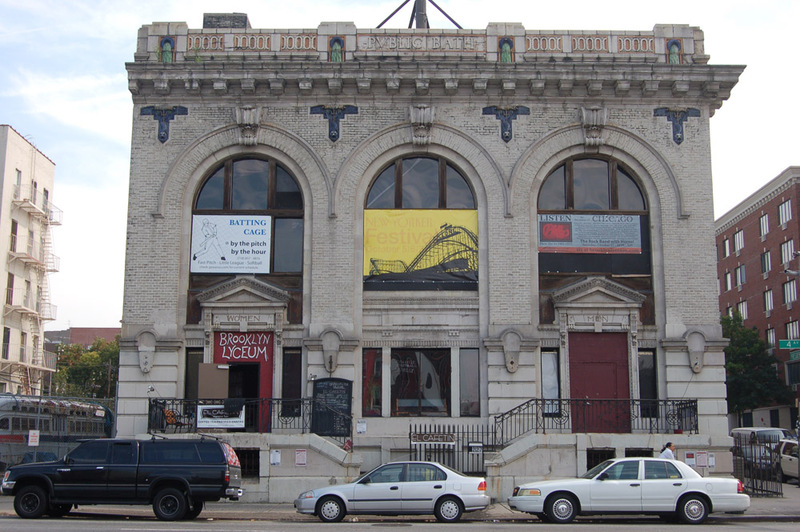 The facility is still in use as a recreation center.) 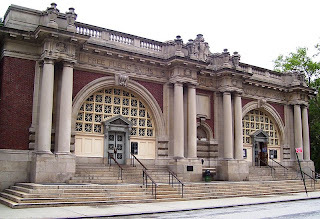 The Asser Levy Public Baths (built 1904–1906) are located on East Twenty-Third Street at Asser Levy Place. Go for a stroll through Manhattan’s Greenwich Village or Brooklyn’s Cobble Hill, and you’ll find yourself surrounded by so many old houses that you may feel like you’ve taken a trip back in time. Many of the buildings you’ll pass were constructed in the first half of the nineteenth century. Lovely, aren’t they? Now here’s something to think about: most were built before indoor plumbing made its way to New York. So where did people go to the toilet, you ask? Why, in the backyard, of course! Take a peek behind any old house or apartment building in New York City, and you’re likely to find a yard of some sort. Today, these little patches of ground are used for gardens or barbecue grills. But not long ago, they would have held an outhouse or privy. These structures came in all shapes and sizes. Some were quite fancy. Others were little more than a shack. But no matter how nicely an outhouse may have been decorated, it was still just an outdoor toilet built over a pit. If you were rich, your family would have had its own outhouse. If you lived in an apartment building in a poor neighborhood like the Lower East Side of Manhattan, you probably shared the same privy with more than fifty other people. Even the deepest pits tend to fill up rather quickly when that many people are making deposits. The filth would often overflow into the courtyard and seep into neighboring basements. Keeping an outhouse or privy (somewhat) sanitary was a nasty business. Just like today, well-off New Yorkers hired others to do their dirty work. The pits beneath their outhouses were emptied by “necessary tubmen” who worked the nightshift. While the rich slumbered, the tubmen would fill their “night carts” with sewage, which they later dumped in the city’s rivers. On hot summer nights, even the wealthy couldn’t escape from the stench that followed the tubmen as they made their rounds. Want to visit a New York outhouse? 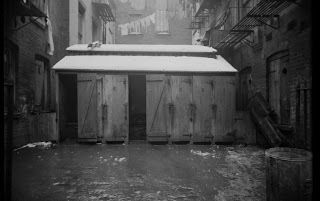 There’s a reconstructed privy at the Tenement Museum, located at 97 Orchard Street. Want to read a bit more? Click here. 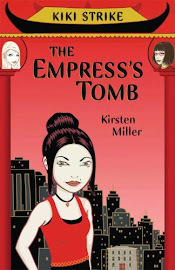 I promised to post about a few of New York City's underground attractions, and I will honor that promise. However, I do so with a heavy heart. As you know, this has been a terrible week for the greatest city in the world. It's been particularly brutal for those who live in Staten Island, downtown Manhattan, and the coastal parts of Brooklyn and Queens. I urge each of you to help in anyway that you can--whether that means giving a few dollars, a few cans of food or a pint of blood. One of the reasons that the hurricane caused so much damage in downtown Manhattan is that the entire island is practically hollow. Gazing up at the skyscrapers, it's easy to forget that there are miles upon miles of tunnels beneath the asphalt. Subway tunnels. Automobile tunnels. Parking garages. And probably quite a few passages that have been forgotten over the years. Today, most streets are dry, but many of those underground spaces remain flooded. It's still too early to know how much we've lost. 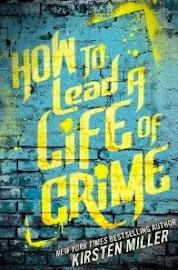 So, keeping that sad fact in mind, here's the first "underground" entry in the Irregular Guide to New York City . 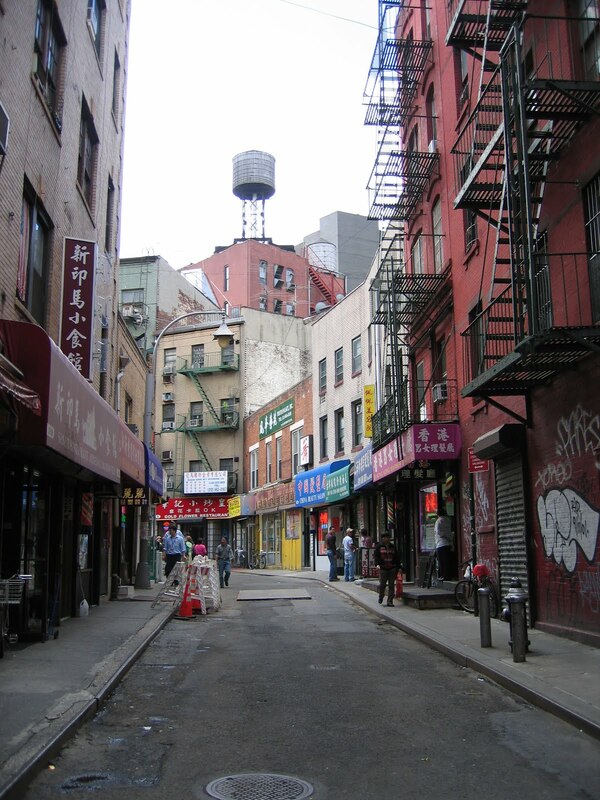 . .
Long before Chinese immigrants began arriving in New York, the Manhattan neighborhood we now call Chinatown was know as Five Points. 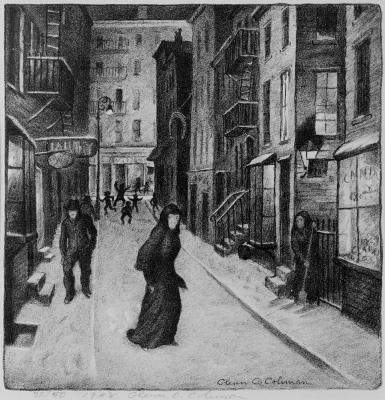 For much of the nineteenth century, it was the most notorious slum in the United States. Giant pigs roamed freely, eating garbage right out of the gutters. Violent gangs with names like the Dead Rabbits and the Pug Uglies fought to the death in the streets. The air reeked of raw sewage and rampant disease sent countless residents to an early grave. 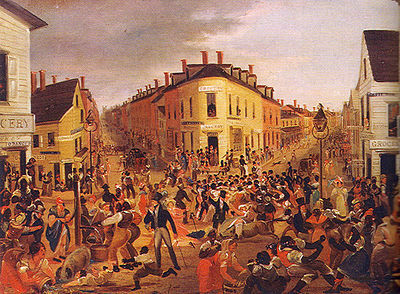 While most of the people who called the slum home were honest working folks, the Five Points had a reputation as a haven for criminals. Visitors who wanted a glimpse of the “dark side” of New York would often take a tour of the neighborhood. But only the bravest would have ventured into the tunnels beneath it. 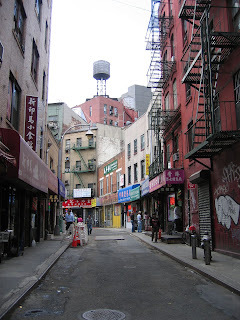 Most of the mysterious tunnels under Chinatown probably date to the Five Points days. 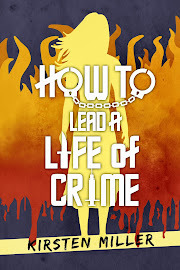 But by the late nineteenth century, Five Points had become Chinatown, and when the Chinese gang wars erupted in the early twentieth century, the subterranean passages were used by Tong Gangs to ambush—or escape from—their enemies. Today, many of these tunnels still exist, but few people have access to them. However, one passage is open to the public—and if you’re heading to Chinatown, you won’t want to miss it. Go to 5 Doyers Street. (The street was once known as the “Bloody Angle” because so many men died there during the gang wars.) You’ll find an ordinary door with a staircase behind it. At the bottom of the stairs is the Wing Fat Shopping Mall. This strange underground shopping center was once a dark, wood-lined tunnel lit only by kerosene lamps. The locked doors you’ll pass all lead to other tunnels. No one really knows how many there are—or what purposes they serve today. For more information--and pictures of the Wing Fat Shopping Mall--click here! Underneath the luxurious Waldorf Astoria Hotel in midtown Manhattan lies a mysterious train station. Few people have seen it, and even fewer know why it was built—or who once rode in the private train car that still sits on the tracks. Who was powerful enough to have a secret train station built beneath one of the fanciest hotels in the world? And why did he need his own private car? 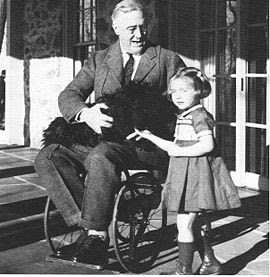 In the 1940s, President Franklin Delano Roosevelt was keeping a secret from the country. He’d contracted polio decades earlier, and the disease had left him unable to walk on his own. He didn’t want the world to know about his infirmity, so he kept it carefully hidden. 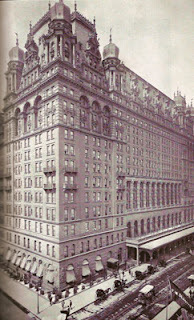 The secret train station beneath the Waldorf Astoria was constructed so that he could enter and leave the hotel without being seen in a wheelchair. 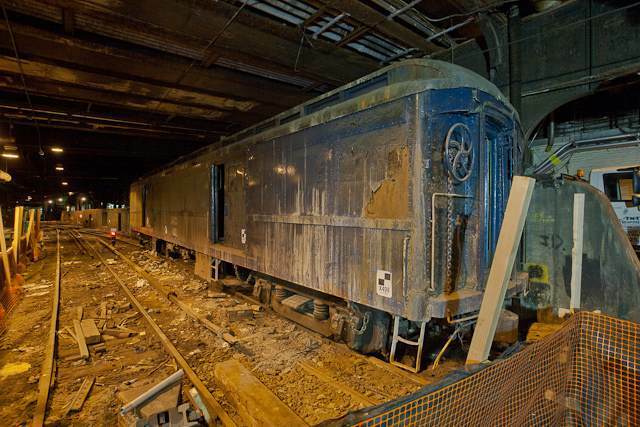 A 1940s-era armor-clad train car (with bulletproof windows) remains parked thirty feet below the New York streets, ready to whisk FDR out of the city at a moment’s notice. Rumor has it that the station itself still serves as an emergency exit for presidents and other dignitaries whenever they come to town. Lots of pictures here. 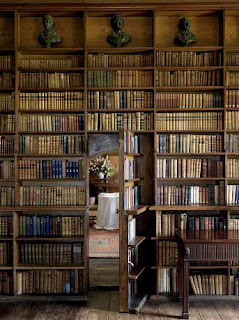 And a cool article on hotels with secret entrances here. 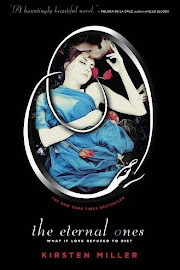 Two hundred years ago, a strange parade took place in New York City almost every single night. If you looked out your window, you would have seen hundreds of cows trotting south to their doom. Then, in the mid-nineteenth century, New York made it illegal to herd cattle through the city’s streets. 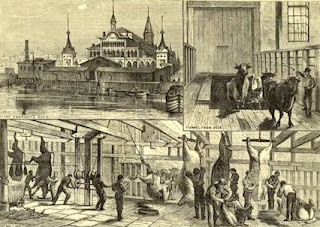 This presented a problem because most of the livestock lived on farms north of the city, while most of the slaughterhouses were located at the bottom of Manhattan island. The solution? Cow tunnels. These underground passages made it possible for farmers to drive their cows to slaughter without blocking street traffic. Eventually, the slaughterhouses moved out of town, and over time, the tunnels fell out of use. Construction crews have been known to unearth strange wood-lined cow tunnels roughly ten feet wide and eight feet high. There’s one beneath Greenwich Street on the west side of Manhattan. And there are said to be two beneath Twelfth Avenue—one at Thirty-Fourth Street and another at Thirty-Eighth Street. The rest have been forgotten—but they’re probably still down there, just waiting to be explored. The next time you’re in Greenwich Village, stop at the intersection of Minetta Street and Minetta Lane*. Are you there? Great. Now take a look around. Believe it or not, you’re standing on top of a roaring stream. Over a century ago, before Manhattan was flattened and covered in asphalt, the island was a pretty soggy place. Much of downtown was marshland, and dozens of creeks and small rivers trickled all over town. As the city grew, ponds and swamps were drained, and New York’s streams were buried beneath its streets. But these “subterranean waterways” never dried up. They’re still there, flowing beneath our feet. (A good sign that you’re near one is the presence of a weeping willow tree.) There’s only one problem: very few people today know where they are. And if you start building on top of a forgotten spring, you’re going to end up with nothing more than a damp pile of bricks. Fortunately, there’s a map that can tell you where to find all of Manhattan’s invisible waterways. Over five feet long and remarkably detailed, the Viele map shows all the rivers, streams, and ponds that no one has seen in over one hundred years. But there’s still one place where you can see Minetta Creek. Inside the lobby of an apartment building at 2 Fifth Avenue, there’s a clear plastic pipe that rises out of the floor. If you visit after a rainstorm, you may notice water bubbling up into the tube. Minetta Creek flows under the building, and sometimes when the weather is wet, it decides to make an appearance. * Another interesting note about Minetta Street and Minetta Lane: at the end of the nineteenth century, this might have been the most dangerous intersection in New York. 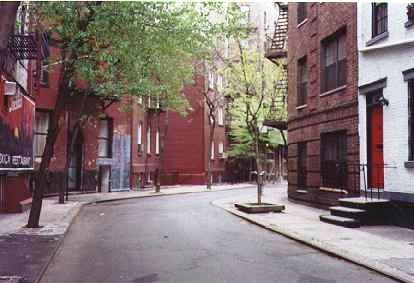 The author Stephen Crane called the Minettas “two of the most enthusiastically murderous thoroughfares in the city.” The Minettas had a dreadful reputation and were said to be home to killers and bandits with names like Bloodthirsty and Apple Mag. 740 Park Avenue has long been considered one of the most prestigious addresses on the island of Manhattan. Built seventy-five years ago, it has been home to Vanderbilts, Bouviers, Rockefellers, and royalty. To purchase an apartment in the building, you must be more than just wealthy—you must be among the world’s super-rich. 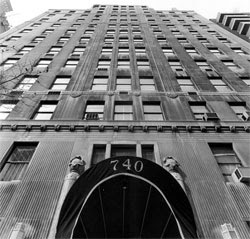 For decades, 740 Park Avenue has also been at the center of one of Manhattan’s most beloved “urban myths.” According to rumor, shortly after the building opened, John D. Rockefeller Jr. built an underground “escape route” beneath it. 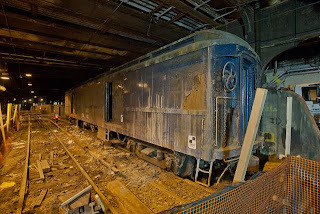 The tunnel is said to have led from the basement to nearby subterranean train tracks where the Rockefeller private train could carry John Jr. away from the city. Most people, including the Rockefeller family, claim that the story is pure fantasy. Now, however, it seems that there may be more truth to the tale than previously thought. 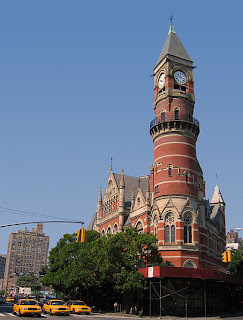 In 2006, members of the NYC Water Works were working fifteen feet beneath the street outside 740 Park Avenue when they happened upon an old vault. Inside, the plumbers discovered a series of hidden chambers connected to the building’s basement. Each had an arched ceiling roughly ten feet in height and walls composed of old bricks. No one seems to know what purpose the forgotten chambers may have served, but some have suggested that they are part of a lost tunnel built not by the Rockefellers, but by their neighbors, the Vanderbilts. Somewhere on the Upper East Side of Manhattan, on the second floor of a building in the East 80s, is a secret (and technically illegal) bookstore known as Brazenhead Books. It’s run by a man named Michael Seidenberg, who has turned his own apartment into a wonderland of used books. The store’s address is a secret, but those who find it are welcomed warmly. 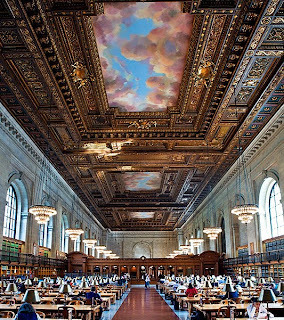 Once inside, there’s a chance you could end up rubbing elbows with some of New York’s best-known writers, but you’ll definitely leave with something you can’t wait to read. 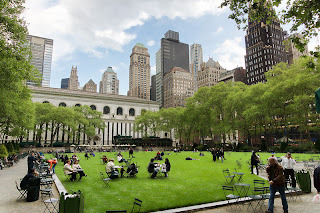 Bryant Park is a lovely public space adjacent to the main branch of the New York Public Library at Forty-second Street and Fifth Avenue. It’s a great place to have lunch or watch one of the free movies they show every summer. But whenever I visit, I find it hard to concentrate on food or films. I’m too busy thinking about the treasure that’s buried below. 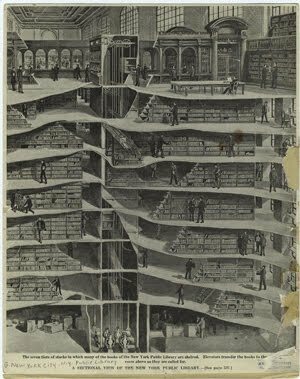 Hidden beneath the park are the library’s archives—two vast floors with 120,000 square feet of space and well over one hundred miles of stacks. Every single shelf holds priceless treasures: Babylonian tablets. The trunks Herman Melville took with him to sea. Theodore Dreiser’s death mask. George Washington’s recipe for beer. The archives’ contents are worth untold millions (if not billions) of dollars. I’d pay almost anything for a little more than a look. And for what it's worth, the upstairs is amazing too. (What? 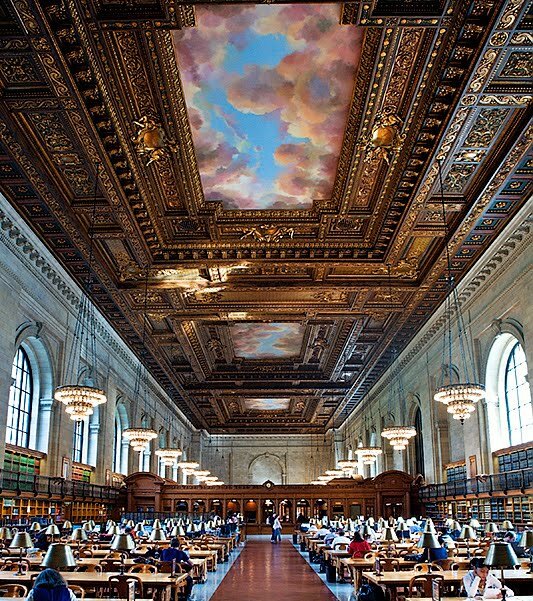 Your library doesn't have chandeliers?) And the people who work there do some pretty cool stuff. CH Presents: The Conjuring Arts Research Center from Cool Hunting on Vimeo. Enter the rare books room, and you’ll find dusty tomes that date from as far back as 1480—and “mind reading” pamphlets from the seventeenth century. Many of the items collected are one of a kind. 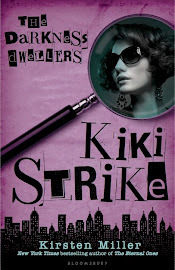 There’s even a book titled Valuable Secrets that I’d personally love to read. What kind of secrets, I wonder? And how valuable are they? If you find out, please let me know! 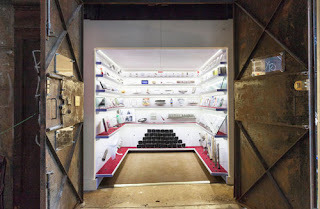 Located in an alleyway on the border between Chinatown and Tribeca in downtown New York City, resides possibly the worlds’ smallest museum, a home to overlooked modern-day artifacts of humanism and beauty from cultures around the world. At the bottom of a defunct elevator shaft-way, in the bowels of what was once a garment factory on lower Broadway, visitors can lose themselves among hundreds of items and their subsequent stories. Each object is accompanied by a number which directs you to a detailed story that can be found in the museum guide or in the audio guide, accessible through any mobile phone. 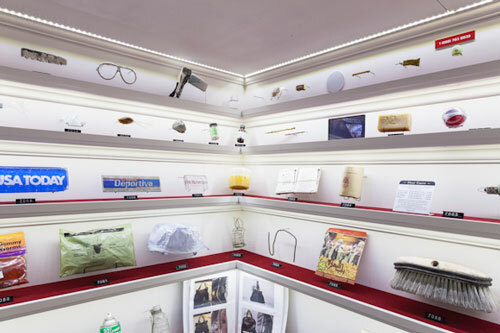 Objects on display at Museum include a toothpaste tube collection and the infamous shoe that was thrown at President George W. Bush's head.